A light gray vertical rectangle on a dark gray background. There is a red diamond in the center overlapping the light gray rectangle. 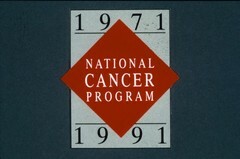 White letters inside the diamond read: NATIONAL CANCER PROGRAM. Above and below the diamond in the light gray are the dates 1971 and 1991.